Today, software innovation is shifting from not just writing the code but also to delivering it to customers with fast time-to-market and with high quality. Rooted in agile development methodology, DevOps promises to deliver applications quickly and to improve the coordination between development and production activities. Learn how guest speaker Tom Grant, Senior Analyst at Forrester sees DevOps and the market trends that are shaping the DevOps movement. You will also learn how Equinix, a leading provider of global data center services, uses Electric Cloud automation solutions to make DevOps a reality—building, testing and deploying applications in a minutes and improving software quality in the process. Electric Cloud’s software delivery automation product ElectricCommander is an excellent alternative to AnthillPro. Many organizations are leery about the future of AnthillPro since its acquisition by IBM. - how a leading consumer brand switched over from AnthillPro to ElectricCommander. Agile development creates more frequent builds. A CD platform that optimizes and parallelizes large builds across hundreds, or even thousands of cores is good. A solution that automatically detects dependencies to eliminate broken builds is even better. You shouldn’t have to wait until builds or tests are 100% complete before receiving feedback. A CD platform that allows real-time drill-down into warnings and errors as they occur give helps eliminate wasted time and CPU cycles. CD isn’t continuous if jobs in flight are lost when a CI server goes own; or when it takes days for QA machines to be provisioned; or when deployments fail because of differences between QA and production. A CD platform should automate and normalize the build, test and deploy process across ANY environment (public, private or hybrid) with 1-click simplicity. Applications have become competitive differentiators for businesses. Organizations who are able to deliver higher quality applications to their customers, faster than their competition, are winning the race in the Age Of The Customer. Many organizations understand this conceptually but struggle to quantify the benefits and costs of improving delivery capability. In this webinar, Kurt Bittner of Forrester Research, Principal Analyst serving Application Development and Delivery Professionals, will describe how leading organizations have gone about this analysis and how they are measuring their results. Join Klocwork and Electric Cloud as they discuss how to make your embedded software development more secure and more efficient. This is just a precursor to what they will talk about at Embedded World in Nuremberg, Germany the following week. Join this webinar to learn how Huawei Technologies, a multinational networking and telecommunications equipment and services company, integrated Electric Cloud’s solution with OpenStack’s cloud infrastructure to provide a DevOps cloud R&D environment. This allows their engineers to dynamically deploy virtual machines and provides them with an integrated end-to-end automation of the build/test/deploy processes. Learn how this integration provides a continuous delivery cloud solution targeted to deploy in stages across Huawei R&D data center facilities in multiple sites. Con Nie Ong, Principal Staff Engineer, Motorola Solutions, Inc. Managing the use of history files to produce fast builds across a large team of developers building many different projects or products can be challenging. 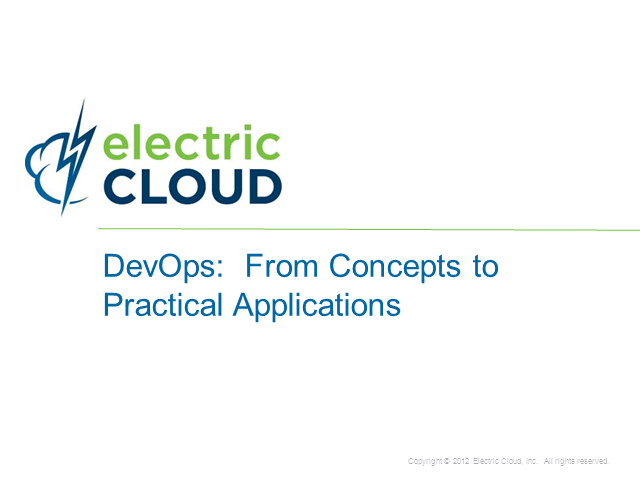 Join this webinar to learn how a team at Motorola manages and distributes history files to developers to maintain fast, efficient builds in Electric Cloud's ElectricAccelerator. ElectricAccelerator generates and uses history files to track dependencies in builds and provide significant performance improvement in subsequent builds of the same source code. Anders Wallgren, CTO at Electric Cloud, & Kurt Bittner, Guest Speaker & Principal Analyst at Forrester Research, Inc.
Every company is a software company. And organizations are embracing software delivery optimization practices like Continuous Delivery (CD) in response to diverse and unrelenting pressures such as faster time to market, competition, the need for innovation, and staying current with modern software development methodologies. Which organizations should be implementing CD? And how do you know if your company is ready to implement CD? Join this webinar to hear the discussion between Kurt Bittner, guest speaker and principal analyst from Forrester Research Inc., and Electric Cloud. We will present a Continuous Delivery Maturity Map that can help any organization assess their readiness for successful CD implementation. Co-author of the Jolt Award winning Continuous Delivery, Jez Humble has worked as a software developer, product manager, consultant and trainer across a wide variety of domains and technologies. His focus is on helping organisations deliver valuable, high-quality software frequently and reliably through implementing effective engineering practices. In his 23 years of high tech experience, Gary Gruver has led a large organization (400+ developers) at HP on a journey from waterfall to agile development. Gary is passionate about helping large organizations dramatically improve productivity of software development. He is currently working for Macy's.com as the VP of QE, Release and Operations learning about e-commerce and leading a transition toward continuous delivery. He has taken his observations from HP and co-authored "A Practical Approach to Large-Scale Agile Development". Paul Rogers is the Chief Development Officer for GE's Advanced Solutions Group and is responsible for creating solution and service offerings working closely with GE's businesses. In addition, Paul is the executive champion of Industrial Internet solutions for the Oil and Gas division. Before this position, he was a Senior General Manager for GE Energy. In this capacity, he managed a $165M operation where he led 800+ employees across 9 countries and 14 locations to orchestrate a global product development strategy for the emerging Oil and Gas and SmartGrid markets. Paul has been the recipient of numerous GE accolades for engineering product quality, leadership, productivity and risk reduction initiatives. He earned his MS in Chemical Engineering from San Jose State University. Gene Kim, Author of "The Phoenix Project: A Novel About IT, DevOps, and Helping Your Business Win"
Gene Kim is a huge fan of IT operations, and how it can enable developers to maximize throughput of features from "code complete" to "in production," without causing chaos and disruption to the IT environment. He has worked with some of the top Internet companies on improving deployment flow and increasing the rigor around IT operational processes. What is the Automotive Workbench Solution? It’s a software and systems engineering development workbench, founded in a cloud-based, multi-vendor offering (Electric Cloud, CloudOne, Sodius, MethodPark, and IBM) that provides a one-stop shopping and delivery vehicle to you and your engineers. Electric Cloud's partner, Sodius, presents the benefits of the Automotive Workbench Solution at Spark 2013. Providing a centralized system to manage the pipelines for all your applications can be daunting. Enabling several disparate teams to achieve continuous delivery can sound unrealistic. How do you satisfy the need for visibility, scalability, consistency, repeatability, and flexibility with a single tool? Learn how Electric Cloud created a solution to help you accomplish these goals. LSI had a large and growing number of test cases for testing different variants of chipsets, features and platforms. QA was unable to handle the scale of testing needed for a release. An automation solution was devised around Electric Cloud's ElectricCommander to allow test case selection based on multiple user-selected criteria and then execute those set of test cases manually or on a schedule. Results of those test cases were automatically emailed to users. This presentation describes improvements the automated system brought to the LSI team. Learn about Electric Cloud's innovative products. A simple overview of what the products do. Hundreds of organizations and thousands of developers across the world use Electric Cloud’s ElectricAccelerator. They already benefit from the advanced, sophisticated, software build acceleration solution, which is optimized for Visual Studio and make-based development environments. With the latest ElectricAccelerator release of the Visual Studio integration, the product took a leap forward in terms of usability and configurability for an optimized software build environment. Combine that enhanced usability with the incredible build performance of the ElectricAccelerator engine which can speed builds by up to 15x, and you have a turnkey solution to create a world-class build cloud. •How Panasonic is leveraging cloud-based common platform to support globally integrated, always-on development of PASA in-vehicle systems. Are you overwhelmed with the challenges of releasing today's complex business applications? Does it feel like you will never able to hit the market window or quality bar set by your business peers? An effective release management process is a critical capability for organizations that want to get an edge on their competition through innovative software systems and services. Putting process guidelines in place and automating the build process are good first steps, but there are many additional tactics that organizations can use to increase their release capacity, from time-boxed releases, to milestone release schedule, up through continuous delivery of software changes. Join Forrester VP and Principal Analyst Jeffrey Hammond and Electric Cloud CTO Anders Wallgren as they discuss five specific ways to streamline your release management processes with an eye toward faster, more predictable delivery of world class software. We all know that Agile enables software organizations to continuously deliver working software faster to customers (internal or external). This helps software teams to not only deliver products faster but also in tune with the changing market needs. In practice however, organizations still struggle to get the full benefits of Agile methodology because they have not fully automated their practices (development, build, test, release).